Welcome to the Haunted Montreal Blog, the place to stay au courant about ghosts and hauntings in the Montreal region! Published on the 13th of every month, the Haunted Montreal Blog offers information about Montreal hauntings and ghost stories and the spooky walking tours and other special events we offer. As a company that invites the public to share stories, Haunted Montreal is eager to use this blog as a place to share information, spark a conversation and build a community of people who want to explore Montreal’s dark side through ghost stories and haunted research. Please allow me to introduce myself. My name is Donovan King. As the founder of Haunted Montreal, I juggle many tasks. In addition to researching and writing ghost stories and leading the ghost tours, I also write the blog. It is my pleasure to be of service for fans of Montreal ghosts and hauntings! Each month the blog will feature two sections: Haunted Research and Company News. In Haunted Research I will feature Montreal a ghost story I am researching and in Company News we will announce the latest information about tours and special events we are offering. I highly recommend you sign up to our mailing list if you want to receive the blog on the 13th of every month! Our focus is first and foremost on Montreal ghost stories, hauntings, paranormal activities, legends and mysteries. Montreal, being the most haunted city in Canada, has a lot of creepy tales and many of them have yet to be unearthed by Haunted Montreal. We welcome people with a Montreal ghost story to get in touch and start a conversation. We can do in-depth, historical research to try and expand the story into a piece that could be published on the blog – and potentially be included in a future ghost tour! If you have a Montreal-based ghost story, please contact us! Creating effective ghost stories is a serious art-form, and Haunted Montreal aims to provide the very best. We do thorough investigation into Montreal hauntings, including deep historical research, analysis of primary and secondary documents, contextualization, interviews, and academic seminars. The stories are then structured, professionally-written, polished and edited by an English teacher. Promoting the very best in haunted entertainment, we also want to explore other haunted attractions in the Montreal region and nearby cities, recommending the very best to our readers. The rapidly-growing haunted tourism industry is extremely diverse and includes various types of haunted attractions and events: ghost tours, haunted houses, books of ghost stories, horror novella and films, paranormal investigations, haunted hotels and other sites, ghostly bus trips and haunted conferences, where horror entrepreneurs meet to pitch their latest ideas. This month, I am pleased to announce that Haunted Montreal has been doing a lot of investigation into hauntings at McGill University. After months of extensive research, I prepared a proto-type of a Haunted McGill tour. I invited the public to a Jane’s Walk and regaled them with ghost stories about Canada’s most haunted university. 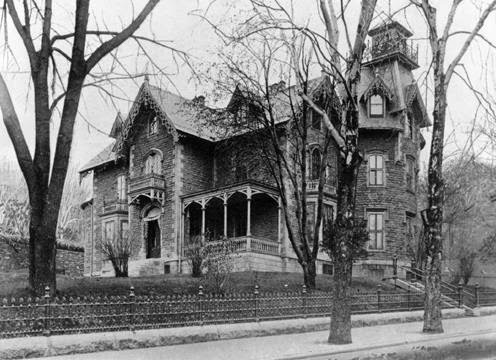 Some of the haunted locations include the Arts Building, McLennan Library, Faculty Club, Duggan House, Alan Memorial Institute, Royal Victoria Hospital and James Administration Building. A feature article about the Jane’s Walk appeared in French in Journal Métro. Starting next month, I am going to feature one Montreal ghost story that we are researching in more depth, allowing readers the chance to look at one creepy tale in more detail. This section is where I will list all of the latest news from Haunted Montreal, including tour dates, special events, and all other pertinent company information. Firstly, Haunted Montreal is hoping it can offer a Haunted McGill ghost tour in time for the Hallowe’en season. Over 40 people attended the Jane’s Walk and many attendees felt the tour should be offered to the public on a regular basis. Before this can happen, we must first discuss the possibility with university officials and get their permission to use McGill campus. 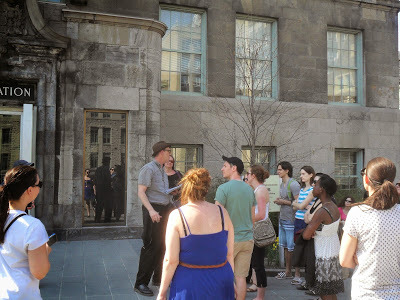 Secondly, Haunted Montreal offers ghost tours to both private groups and the public! Private tours can be arranged for groups of 15 or more people and are subject to availability. For more information, please contact us at info@hauntedmontreal.com. We may add more tour dates in case of high demand. Haunted Montreal ghost tours are very popular and often sell out, so it is advisable to purchase your tickets through PayPal in advance to guarantee your place.Thank you for reading the Haunted Montreal Blog! Don’t forget to sign up to our mailing list if you want to receive the blog on the 13th of every month! Coming up on June 13th: Hauntings in the Duggan House. Learn all about this creepy McGill mansion where academic meetings are sometimes disrupted by paranormal activity. Graduate students have spotted a ghostly woman descending the spiral staircase, and in at least one instance, a research assistant had her purse stolen by a phantom! Constructed in 1861, using materials salvaged from Simon McTavish’s haunted castle, Duggan House is by far one of the most frightening buildings on the McGill campus!